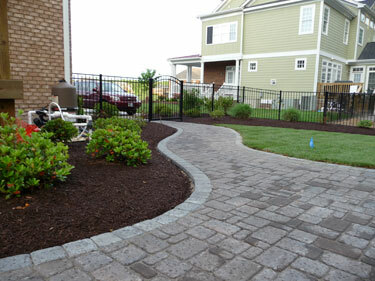 Flagstone and river rock was used to enclose existing tree and create dimension to a flowerbed area in this backyard. Stone Fire pit with landscaped flowerbeds were installed to create an outdoor living space that was not only functional but a great place to sit back and unwind. The combination of a Flagstone Retaining wall and River Rocks were used to create a flowerbed with curb appeal. Flagstone Retaining wall was a great addition to create dimension to a landscape design. Whether your site has a need for a retaining wall due to a sloped yard or to just give an edge to separate the beds from the lawn, walls and raised beds offer an aesthetic appeal to a landscape design.